As part of his latest exhibition, FACT Director Mike Stubbs considers the effects digital technology is having on our working life, and asks: is our understanding of the eight hour day still relevant? Thank you for taking the time to read these words. I hope you value not only my physical effort in typing on these computer keys (less expended than on a mechanical typewriter or than with a pen), but also the knowledge and thinking power I am bringing to the page. I am assuming you are not reading this professionally and therefore not being paid to read, though having more knowledge and something to talk about will possibly improve your employability. On average, writers are paid one pence per word. On this occasion I am writing as part of my salaried job, but I am very interested in this subject and it is a real pleasure. I am enjoying the process and feel a sense of autonomy and control. If I was writing copy for an advert for false tans, I might feel differently. Work to rule, the ‘go-slow’ or time-wasting have traditionally formed types of protest within historical settings of industrial dispute and precede the strike. Being seen to move slowly or to make no physical movement at all is a clear signal of non-activity or disruptive behaviour. It’s the stage before strike action begins, whether swinging pickaxe or tapping keystroke. Slow movement and duration also form components of performance art or Actionism. Dadaism actively confounded oppressive systems of war and logic. Artists such as Tristan Tzara and Kurt Schwitters were major proponents of these movements and created art which challenged rationality and order. 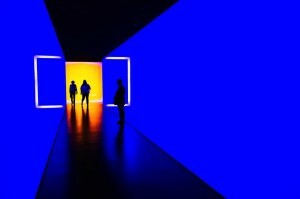 Artists have continued to deconstruct or re-appropriate not only through ideological motivations, but also through an ontological approach to the world, reflecting on our assumptions as to how it functions; the curiosity to look at things more closely and observe subtle differences and values. Artists are neither loafing nor lazing; they are driven, motivated and virtuous – and they create new value for themselves, to share with others. However, this contradiction and tension between risk-taking and the desire to reconsider value can profoundly challenge our naturalised paradigms of efficiency. In the 1970s, performance artists Chris Burden and Tehching Hsieh committed dangerous acts: Shoot (1971), where Burden is shot in the arm by a friend, and Hsieh, who jumped from a window to perform Jump Piece (1973) breaking both of his ankles. Hsieh to this day prefers not to discuss this work. However, these actions represent the antithesis of efficiency, having more in common with self-mutilation associated with deserters during active service and workers trying to get off the production line through self-inflicted injury, extreme forms of the ‘go-slow’. However, for Time and Motion, it is Hsieh’s One Year Performance, which is most suitable as an icon of challenging our notions of time, labour and value in the context of Taylorist efficiency. When I introduced Tehching Hsieh in Sheffield in the early 1990s, the artist replied, ‘thanks Mike, for wasting my time’, a provocation potentiality insulting the host and audience, but really provoking a question as to the value of time spent at its most fundamental level. 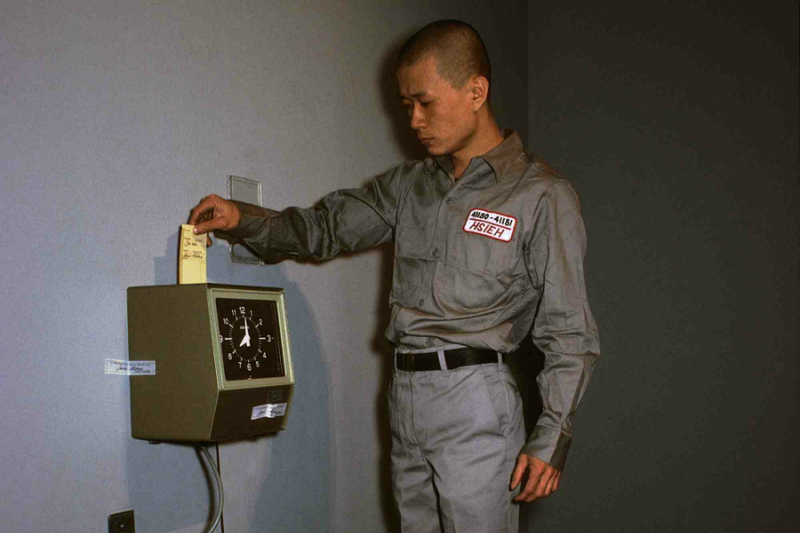 In One Year Performance (Time Clock Piece) (1980–81), Hsieh ‘clocks on’ every hour for a year, day and night, in the self-made cell of his studio. Hsieh rejects our assumptions on how we spend our time, begging fundamental questions on how we create value and how we value time spent. Not only that, he fundamentally challenges any notion of ‘productivity’ as might have been determined through a time and motion efficiency study as prescribed by Taylorism or the invention of mass production in Henry Ford’s car plant of the early 1920s. Charlie Chaplin still reminds us, in the classic film Modern Times (1936), how we are always trying to keep up with the machine, quite literally being crushed by a cog. Then, in a new modernist world, fear of industrialisation seemed real and clear, anxieties of time, space and productivity made manifest. Artists have explored most aspects of the contemporary world, suggesting new modalities of life and existence. New types of relationships and scenarios, formed through digital networks, artificial intelligence and big data, present incredible opportunities and challenges. In adjusting to a society where productivity continues to increase while employment opportunities decline, we are becoming progressively detached from the physical mechanical world our forefathers helped shape. Our current pervasive socially networked condition is a happy bundle of work-life balance, 24:7; we are the machine. Systems of value creation, labour and self are further entwined. As we wrestle with new realities of a globalised experience economy, work and recreation have become increasingly blurred. 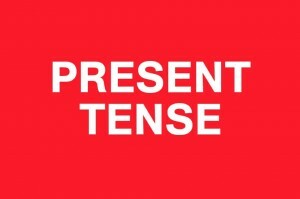 We are confronted with learning new definitions of consumption and production, with our multiple digital identities across shrinking distances in compressed time. The abstraction of our digital domain is constantly diminished as our ability and desire to see finer detail and algorithmically track everything advances. As our devices to perceive this detail improve, so we can better define the way digital becomes tangible. Data always has been material and we learned from Nicholas Negroponte’s Being Digital in 1995 that the cables along which this data travelled were the new motorways. We have no excuse to consider digital as an abstraction, nor drone attacks nor cyber bullying. Operators do know when they kill the enemy flying unmanned drones into battlefields. Redefining working life in digital space is one of many areas of research that needs attention. Those that still see the ocean as a bottomless pit and digital space as an infinite ‘other’ need help in visualising alternatives; we are the ‘other’ and we have compelling environments to help people learn. Design for disassembly, for example, is another way to look at built-in obsolescence. With combined technologies and learning, we can rethink manufacture and disposal, considering the end of the life of stuff, conversion of waste to fuel, whether digital noise, redundant data, bio-mass or the clinker from smelting iron, what Ned Rossiter terms ‘dirt research’ (see Depletion Design: A Glossary of Network Ecologies). More than 27 million people play MineCraft, a game where, starting with a landscape and a pickaxe, players can produce their own virtual world. It’s a mass phenomenon that has captured imaginations and instincts, an environment of online collaboration, industry and destruction. Dubbed ‘first-person Lego’, this is a sociable space of design, asset management, life and death, a game with few rules placing the player at the centre of a domain to be built. Games like this are the manifestation of media theory and experiments practised by scientists and media artists in the past, now providing user-friendly bricks in redefining our understanding of identity and embodiment. With novel values of exchange proliferating across all aspects of life, trading digital assets is imbued with as much belief as collecting art or panning for gold. For a 10-year-old, putting the pick down is hard, even when it’s bedtime, the sense of purpose, pleasure in making and peer pressure to collaborate is immense, even if the giant model of the titanic has ‘no purpose’. 75 Watt (2013) is an artwork in the Time and Motion exhibition that reverse engineers value in the supply chain. Artists Cohen Van Balen collaborated with choreographer Alexander Whitley (see his full interview here) and a group of workers in a Chinese factory, hired specially to make a ‘useless’ physical object. However, the product of the labour on the production line is a dance, not useful and not an object as we have come to know it. In a society where all leisure and work are interchangeable, a series of movements by the workers can be perceived as the product, which embodies a complex set of relations on a global stage while actioning a new form of trusting relationships. These relationships fundamentally challenge assumptions of industrialised labour and consumption. Producing ‘nothing’ is a highly relevant and valuable proposition for a ‘bling’ society still obsessed with gold-plated Bentleys and champagne lifestyles. Seventy-five watts is the average output of energy a human can expend in a day. What if we speculate on how that energy can be employed to create many outcomes and products, such as a dance? We have choice in all we do, yet when labour is channelled and when those 75 watts are multiplied by a workforce of 2000 men and women in an Amazon distribution warehouse, do those 150,000 watts of energy get used to further our humanity and give people meaning in life, or have we merely converted humans into robots? Striving to achieve a work-life balance and now enabled to work anywhere, anytime, how are we going to differentiate along these traditional divisions? Nineties fantasies of working from the beach may have materialised for the super-rich. Work ethic, guilt, fear and pleasure drive those lucky enough to have employment to overwork as always. The rubric of eight hours’ work, eight hours’ leisure and eight hours’ rest – fought hard for in the nineteenth century during the campaign for the eight-hour day – evaporates for most us as our leisure is the work and our work the leisure. Do you have one or two Facebook accounts? How are those under-employed contributing within new economies across the world, as consumers and players, or is this just a way of dressing up mass unemployment and shifting the problem as employment patterns change? As our future world of work involves hybrids of network, database and communication skills, traditional roles such as clerical and office work become further vulnerable. As manufacturing represents only one in ten jobs in the USA and is increasingly automated with industrial robots, this starts to show a trend that productivity continues to grow while employment diminishes. What dirty labour there is left to do can be migrated to the latest place where people work for the lowest wage, where robots are too expensive or have not had those competencies designed in as yet. However, this is a transitionary phase – as healthcare and education become distributed via new technology, and mining gets automated, we really could be heading for a worldwide state of unemployment. My grandfather owned his first watch on retirement, when he needed it least. Until then, he had relied on the Vickers shipyard hooter to signal the end of the working day, as did his wife, to put on his tea. The hooter was the town’s clock. 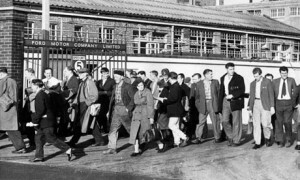 Workers leaving the factory are more difficult to discern when they are remote workers logging out of their computers, but although the factory gates may be digital they are just as real for most. In the Lumière film of 1895, Workers Leaving the Factory Gates, there is clearly a factory and a place of work. The utility of time and motion spent is less easy to evidence when work has become tacit in a knowledge economy, or through transactional work such as in the service industries, than in what Time and Motion collaborator Jeremy Myerson terms ‘transformational work’ (see New Demographics, New Workspace: Office Design for the Changing Workforce), where objects are hewn of stuff and raw materials such as steel are converted into cars. Value creation relies on the suspension of disbelief, meaning that the act of persuasion and transaction has always had as much to do with commanding a good salary over earning a wage through brute strength and stamina, often based on historic distortions of power and privilege. The knowledge economy is testament to that. Within the context of looking in an art gallery, audience affect and learning are as important to our economy of operation and function as the production of art. We count visitors in a free exhibition to prove the social worth of the art experience, or sell tickets and the market dictates its need. To reveal the tacit understanding within the transactions and understand better where lies the intrinsic quality in a contemporary centre where we have already pioneered consumers becoming producers with digital technology, we both use algorithms and personal contact with more effect. Understanding digital preferences and ‘liking’ driven by powerful algorithms, real-time feedback loops can improve products, services and our overall experience. The symbiosis between tourist guide and tourist, seller and shopper, artist and audience are constantly monitored to improve business. Taken across most aspects of society, all our relationships and experiences might become more refined, efficient and pleasurable, leading to an improved quality of life for all. But how is automation, with its new rhythm of time and space, helping to spread the load when, for many, work still looks like it did for their grandparents: physical graft? Mechanised docks in Liverpool provide a fraction of the opportunities they did in the 1960s. How will we spend our time going forward when we are still wedded to expectations, models of labour and societal contracts located in the wrong industrial revolution? Within this context, the Time and Motion programme at FACT is an experiment in collaborating with a range of creative producers and researchers across the venue, audiences, work and digital spaces. It is a creative enquiry into new types of working life, asking the public to contribute their views and also contribute to a real-time experience, provoking and challenging us to question how we spend our time and whether we are working, playing or sleeping. As we move from utopian fantasies of labour-saving devices to a reality of ‘endless work’, mass surveillance and cyber-loafing, how are we coming to terms with these new patterns and social impacts? We are living the paradox of a society of workers without work, where entertainment, consumption and leisure only underscore the lack from which they are supposed to distract us. The mine in Carmaux, famous for a century of violent strikes, has now been reconverted into Cap’Découverte, an entertainment multiplex for skateboarding and biking, distinguished by a Mining Museum in which methane blasts are simulated for vacationers. This is not only a polemic on work and labour and a questioning of fairness, but also a proposition on how we can extract value and meaning through observing the incidental and incremental, how we can accept that quality can be found in most things and genuinely innovate better ways of extending across space and time. Was the American worker who outsourced his own job to a Chinese worker cheating his boss or synthesising smarter ways of working? Digital or otherwise, equality of time and labour needs to be fair and time spent needs to be as pleasurable as we can make it, reminding ourselves to keep moving, enjoy the rhythms and enjoy work as another part of life. I write these notes from my bed, the kids are playing MineCraft, I am privileged in not having to brave the cold and rain on a black bike to get to the factory gates. It is 6.30 a.m. and I am just starting my 12-hour day on a laptop.